The aim of Expo 67 was ‘to provide an explanation of the world to each and everyone of its visitors’. 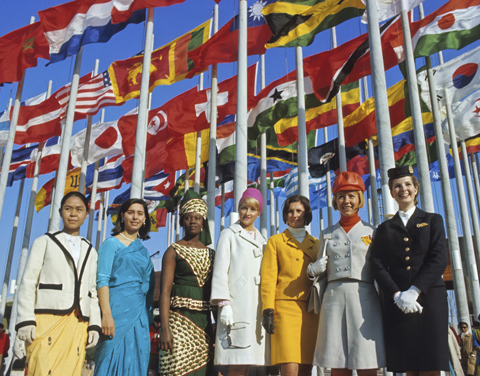 1967: Canada Welcomes the World is a documentary project focused on the national pavilions of the sixty countries that participated in Montreal's 1967 World Exhibition [Expo 67]. Every pavilion will be accessible through photos, footage, architectural drawings and promotional material. With sixty exhibiting countries, Expo 67 established a new record of participants for World Exhibitions. It was the first time in the 1960s that the “superpowers”, USA and the USSR, were attending a world fair simultaneously. Their ‘face to face’ confrontation would be one of the highlights of the event. Expo 67 was reflecting the tensions, fears, hopes and dreams of the Cold War era. From another perspective, the political map of the world had just changed in a very promising way. Starting in the late 1950s, many countries in Africa and the Caribbean had gained independence from the colonial powers. Expo 67 was the first time that many of these new nations were presenting themselves to international audiences. Their participation, besides that of the countries from Europe, Latin America, the Middle East and Asia, would provide visitors with amazing opportunities to gain a better understanding of a world that was reconfiguring itself. For many Canadians, it was the first opportunity to learn about many of these countries and cultures. The success of the national pavilions at Expo 67 was a promising preface to the world that was about to come. After the establishment of the Points System at the end of 1967, race and nationality would no longer be the criteria to admit immigrants to Canada. Education and skills became the new foundation for the development of an open, diverse and multicultural society.